eCreamery and its website, eCreamery.com, sells ice cream but with a twist. All orders are custom made. You name the flavor and eCreamery will make it from scratch. Some favorites include Almond Joy, Banana Foster, Green Tea and Doug’s Happy Hour, which includes a mix of premium stout ice beer and pretzels. Business partners Becky App and Abby Klusmire purchased the company in 2007 and what they’ve done and they way they’ve done it has recently resulted in a dramatic increase in sales. PeC: How long has the site been in existence? APP: Rod Valeroso, whose family owns an ice cream business in the Chicago area, originally created the site in 2004. He developed the original concept and website while he worked part-time at the parlor and went to school. Between 2004 and 2007, the site had fewer than 75 annual orders. But we saw the concept’s potential. 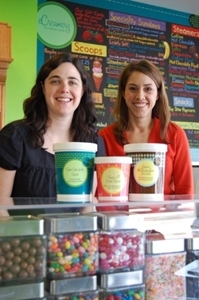 In early 2007, we purchased the site from Rod and moved operations to our Omaha ice cream parlor. With Abby and my marketing and ecommerce experience, we set about improving the site’s usability and creating a new brand identity for eCreamery. PeC: You recently experienced more than a 100 percent increase in sales. What do attribute that success to? APP: Mainly our new website. We gave the brand a facelift to better reflect the quality of our product and gave top priority to ease the users’ shopping experience. Just like a corner ice cream parlor, we wanted eCreamery.com to be a “place” customers have fun going to shop. I think we accomplished that. PeC: In your opinion, what is the key to success online? APP: I think we’ve seen online success by immediately connecting with our customer. Just like the expression, “You never get a second chance to make a first impression,” a site visitor makes a decision about the credibility and quality of who we are and what we offer within the first few seconds of entering our site. As any retail brick-and-mortar operation, the customer or guest should feel welcome and enjoy being in our store. The key for us has been immediately visually communicating the quality of our product and offering an enticing invitation for our guests to stay and shop awhile. PeC: What were some of the challenges of rebranding and getting the website up? KLUSMIRE: The thing for us was we were starting with a product that wasn’t that branded, so in rebranding the biggest thing was it wasn’t there among the public. We weren’t really changing it. We were, I guess, just creating it. APP: We thought the site needed to better reflect how good the ice cream was. When you look at it before, it included colors that we didn’t see as appetizing and the photography of the ice cream didn’t communicate how deliciously indulgent and how fantastic the ice cream was. We started off by giving the website a new voice. Before, it was just very technical. It was very factually based about ice cream statistics and things. We felt our customers really wanted to get on the website and be imaginative and creative and come up with some recipes. We just gave it a more fun, almost whimsical voice. PeC: How difficult was it to initially get the website up and going? APP: It was hard to figure out how to photograph ice cream and visually communicate how good our product was. And you only have about a three-minute window to actually shoot it. It was also really difficult to explain all the steps involved in creating your own flavor. There’s was a lot of education that went on to clearly communicate that in effort to keep customers on the site and not have them throw their hands up in the air and walk away. It took a lot of time to lay that out. PeC: How much of your business is online? APP: About 90 percent of our custom orders are from the website. PeC: Other companies sell ice cream online. How do you try to distinguish yourself from the competition? APP: We are the only ones where you can actually design your own flavor.